Looking for pc games in China? Not a problem, they're sold everywhere. Console games and consoles? Not a problem, they're also sold everywhere, despite the fact that video game consoles are banned in China. 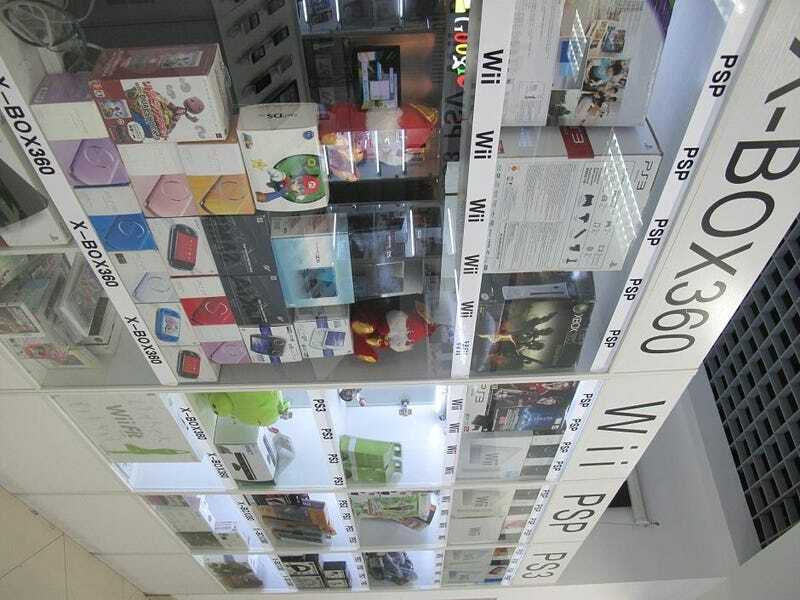 The sale of gaming consoles in China falls into the category of the gray market. Despite the connotations of a black marketesque deal where stores are hidden and passwords are needed, that is not the case. Video game shops are in business, selling consoles and console games in super shiny shopping malls and regular old store fronts, and, in Beijing, in dust covered historic buildings. To the Chinese, this is just a regular thing. When you ask a Beijing person where is the gray market, they won't know what you're talking about. But ask them where to buy video games, and they will send definitely know where to send you. The gray market is a only a term used to describe the ambiguous sales of import products and banned products. You can find legal items that have not been banned on the gray market as well as banned goods. Gundam model kits, cell phones and pc gear released outside of China before a Chinese version is ever out are some of the things that are found in gray markets. Video game consoles are illegal in China; however, the ban does not include Hong Kong, Macau, or Taiwan. But since the year 2000 video game consoles have been banned in the Chinese mainland. The reasons behind the ban are obscure at best; one of the major reasons for the console ban was to prevent Chinese youth from wasting their brains, and another was because of the stringent cultural import laws in China, such as only allowing 20 foreign films to be shown on movie screens a year (yes only 20 foreign films a year, including Hollywood productions). Hong Kong and Macau operate as special administrative regions and are pretty much autonomous and thus consoles are sold. In fact, there are even Hong Kong versions of many consoles. Taiwan is pretty much like Hong Kong and Macau but because of the Taiwan "issue" there are more political factors in play, and video game consoles are not banned. Instead, they are a part of the gaming culture in Taiwan. However, the ban on consoles hasn't stopped Chinese gamers from buying consoles or playing console based games. In fact, the main limiters on console sales in China to the general public are supply and price. It's hard to imagine but the vast majority of China's 1.3billion people are unable to afford a console. According to People's Daily, the mouth piece of the government, the average yearly income across China is about US$5,900 a year. Take into account the number of super rich pulling up the average of the super poor and there might be a clearer number but unfortunately official sources usually account for the SUPER WEALTHY. The following gallery is a look into the gray market. For the purpose of this report, I visited Beijing's High Technology district in Zhongguancun and the tourist trap that is Guloudajie. For more information on about the ban, Brian Ashcraft wrote a very informative piece on the ban back in 2010 Why Consoles are Banned In China. Why Are Consoles Banned In China? Zhongguancun (or ZGC) is located in the Haidian district of Beijing and is notable for being the home of many tech companies in China such as Microsoft and Sohu. ZGC is also known for its technology market. The first and second floors of these markets sell licensed products, and the stores/booths are usually legitimate. Here is the building guide to the Elion/Z plaza market located right outside the Zhongguancun exit of subway line 4. The first floor holds various brand stores such as Cannon, Samsung, and the works; the second floor caters to laptops, desktops, and other computing related articles. The third floor and up are made up of DIY stores—stores selling parts for various electronics, not just for computers. The basement floors are where you find your gray market . A shop that offers custom built PC's. Take the escalator down and you will reach the gray market. A hacking den of sorts hidden right beneath the escalators. They're like the Harry Potters of the gray market. A look at the desk of a hacker. I don't really know why he is tearing up the PSP but I'm not a professional. A man watches as a store clerk (not pictured) explains how to operate his newly hacked Nintendo Wii. A store clerk shows off the games that come with a hacked PS3. Stores are now offering hacked PS3's with 1TB hard drives loaded with games for the equivalent of US$400. A foreigner checks out gameplay footage in front of a store. Customers and sales people haggle over prices for systems and games. The store front for a PC gaming accessories store. Many stores such as this one do not really make money through walk in customers. They are more less a store and a warehouse, where customers can come in if they don't want to wait for shipping. More and more gray market vendors are starting to sell online on Chinese sites such as Taobao. Magic the Gathering is not banned in China but the gray market is one of the best places to purchase cards. Eager sales people try to get customers to walk into their shops. Shifting away from the northwest part of Beijing to the central part of Gulou. Guloudajie has many game stores that blatantly sell video game consoles. A game store located on Guloudajie. A hobby store that specializes in selling Japanese and American import toys. The gray market does not only refer to video games. Another store that openly advertises they sell games. Cats! Who would've thought that console boxes would make a great jungle for kitties to play with? Look at all those PS3's and Xbox's! The sign reads, "We do repairs, as well as dual hacking Xbox 360s—hacks that allow for linking and downloads". This sign reads, "Perfect iPhone, iPad, iOS 5, and Xbox 360 jailbreak. Will wipe system on the spot". Notice how they also accept Visa.